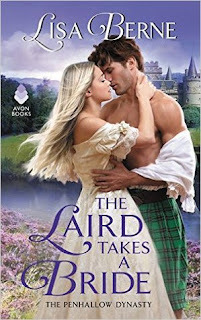 The Laird Takes a Bride is book 2 in The Penhallow Dynasty series. I thought Lisa Berne's debut book, You May Kiss the Bride was quite well done so I knew I had to grab this installment. We've changed over to a new set of characters, Alasdair Penhallow and Fiona Douglass and boy are they headstrong. It lead to a really entertaining read to see what would happen next. We start off finding out that Alasdair Penhallow, laird of his clan is now 35 and unwed. That cannot be since there is an ancient clan law that requires him to find a bride or if he refuses he'll be punished by death. Not wanting that to happen, he's to invite the eligible highborn maidens to his castle so he can then find a suitable bride. I've been seeing a trend lately in historical romance books that are doing The Bachelor type tropes which I find really interesting but I can't complain since I've been enjoying them. This is where Fiona Douglass comes in, she wants nothing to do with this mess, but at risk of death if she disobeys she's there but not playing nice. The other three ladies are more than happy to play for Alasdair's affections, but Fiona's indifference captures his attention. When Fiona winds up saving Alasdair's life their fate is sealed and they wind up married. I knew the rest of the book would be them butting heads and trying to get settled in their marriage. And man did they have issues pop up. You have two headstrong characters that are set in their ways and it was interesting seeing who would compromise or what argument would arise next. The Laird Takes a Bride was an entertaining read full of bullheaded characters. While I did enjoy this installment, I found myself a bit detached from the characters at times and some of the content made me indifferent. It didn't stay that way for long, but I had those feelings pop up several times while reading. I can't really put my finger on it. Overall though, the book was quite well done and rather enjoyable. 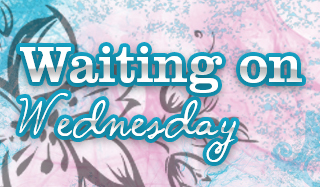 If you're a fan of Historical Romance you should give this series a try! I actually don't love the whole Bachelor (or Bachelorette) thing to be honest, but it's great when it's fun and the hero (or heroine) is focused on the heroine (or hero) only. I do love stories in which the couple gets married early om, for whatever reason. I'm glad you mostly enjoyed this one! I'm glad I'm not the only one noticing this new trend!!! So far I've been okay with it, I think this is my third one though. If it's going to be in all the books I'll grow tired of it pretty fast. It's been a while since I've read a book like this but it sounds good. As someone who doesn't like The Bachelor and thinks it's silly, I think I would find the setup for this book silly. But that's just me. This is not my trope.